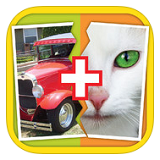 Here you can find all cheats to the game 2 Pics 1 Word: Mix Pics Puzzle by Second Gear Games. There are two parts to this game. The first part is called “Two In One”. You’re given 2 pictures, with each picture representing a part of a longer word, and you have to put two parts together to guess the word. The second part is called “Mix and Make”, where again you’re presented with 2 pics, but you’ll need to mix the two pictures and guess the result of this mix. You’re given some blanks and a group of letters of the alphabet at the bottom of the screen. You need to drag the letters to the blanks to form the answers. When you’re stuck, you can tap the question mark to bring up the help menu which will provide you with several options: you can remove extra letters from the group of available letters for 125 coins, reveal a letter of the answer for 75 coins, or reveal one word (for one of the pictures) for 150 coins. And if you still need more coins, simply tap on the coins icon at the top to buy some through in-app purchases.